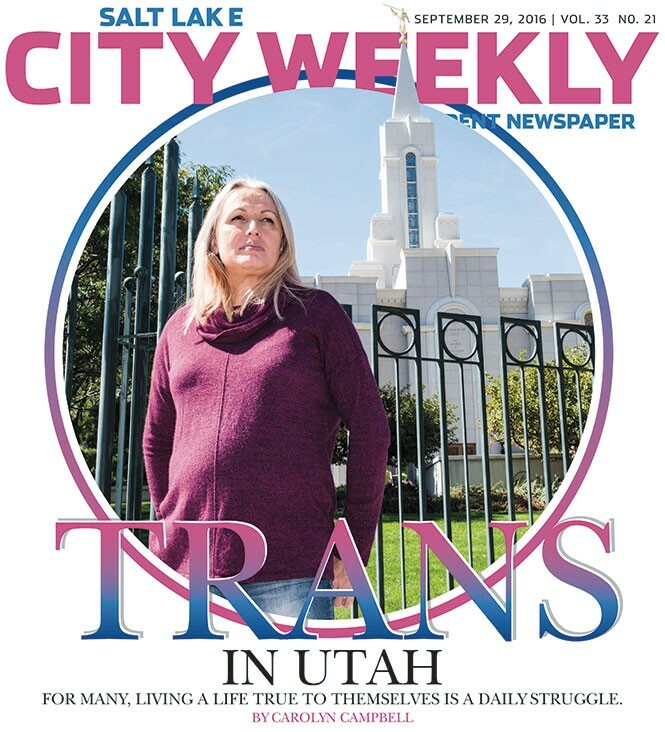 Cover Story, Sept. 29 ,"Trans in Utah"
Opinion, Sept. 29, "Blaine Preserve"
Chris Lee, you're amazing. Keep up your visions. As a child growing up on the west side, I would always find projects to clean up as you did. I would form a group of children, and before they knew what hit them, we were cleaning up areas near the Jordan River walkway before it was even thought of to be that. As I grew and purchased different properties, I envisioned the real need for cleanliness and my community efforts to clean my surrounding areas, for reasons like having others take notice to the beautification and believing we as citizens can't expect the city to do it all. Down the road I worked on one of my buildings to create Juliano's Coffee House & Deli. That was 20 years ago. I envisioned it and made it happen; that was across the street from the baseball park, the ending era of Derks Field. Sadly I had to move on. I moved to Ogden Canyon. I would walk to the canyons every day no matter what weather, [pick up] garbage, then lounge in the hot tub. I just learned recently they closed it; I heard it was for repairs, but it was really a way to stop the pure simple joy. Anyway, I am still working on the old adage "cleanliness is next to godliness." My name is Elaine Trujillo; this is my town, my neighborhood, and I'm back. So if you see a strange girl picking up garbage, it's me. I sing to myself "The Boys are Back in Town" 'cause I do a man's job, but enjoy being a girl! I Love all you clean souls. God bless you all, and thank you from the bottom of my heart! Five Spot, Sept. 29, "The 'Burger King' John Gutz"
I know a guy who drank water every day for 47 years. Meet the newest patient on Lipitor. I was thinking the same thing. Check that man's cholesterol. Drink, Sept. 29, "Utah Wine Economics 101"
... Why is 3.2 beer so damn expensive? And Tequila? Vodka is the only thing cheap. My fave restaurant when I used to live in Dallas charged $2.50 per-person corkage fee, which I found very reasonable. There is no shortage of competition for wines in Dallas. We pay more for liquor than most because the state is greedy. True TV, Sept. 29, "Power, Man"
I am completely sold for Westworld and Timeless. Both draw their main inspirations from science-fiction topics that are completely interesting to me. I cannot also argue about the good choice of cast (Anthony Hopkins and Goran Visnjic). I personally am a fan of both Hopkins and Visnjic, so this is a big plus in my book. The productions also seem solid, as these series do not feel mass-produced upon watching the trailers, but only time can tell this. IMO Luke Cake is like reaching the end of a barrel that was filled with Daredevil and Jessica Jones already. But, hey, this might also surprise me. I have no comment about Conviction and No Tomorrow. So is it a drama or an apologist cheerfest for poor, misunderstood BP? Raise your hand if you're tired of these played-out Mark Wahlberg movies. Just got back from watching it. I liked it. Blog, Sept. 30, "Animal Testing Death at U Sparks Federal Warning"
Let's put you in a freezer then warm you up with a blowtorch and see how you like it. And then there are people that can't afford to help their own pets. Like, I would really like to fix my cat's broken leg. Blog, Sept. 30, "'I Hope They Can Forgive Me': Senate hopeful Jason Christensen on the viral response to his anti-LGBTQ comments"
Utah has such a high youth suicide rate. With men like this I can't imagine why. There are two issues here: what he believes and what he said. He believed what he was saying so you can't claim "foot-in-mouth disease." He should not have expressed his hurtful views on that post. The larger issue is that he wants to become a part of the state leadership and create laws. His views are archaic, homophobic and extreme.